On Wednesday, I attended a lecture on Singapore’s development as a port city. It coincided with our bicentennial since the arrival of Sir Stamford Raffles on Singapore’s shores in 1819. Throughout history, Singapore as a small territory was in search of a hinterland. Most successful cities operate on the premise of having hinterlands that support its economically-viable functions. In the past, much of how Singapore operated was geographical. An example can be clearly seen in the trading route from Europe to Asia. As long as one was travelling by sea, one had to traverse the Straits of Malacca. Note the choke points of concern to us is the Straits of Malacca. In other words, territories along said chokepoints have a natural geographical advantage to exploit. Ships in the old days could not sail for long distances before requiring refuelling, and so had to stopover at various ports of call. It was thus rather natural that Singapore would be considered a geographically advantageous location to set up such functions, since it would have immense economies of scale. In the old days, Singapore’s hinterland was global trade. As long as trade boomed and economies grew, more resources and products must be shipped around the world, hence benefitting Singapore. Many of us Singaporeans would probably also remember the Social Studies lessons we had about the period of merger, where the narrative of the day was that Singapore wanted independence from the British, but could not survive on its own without a geographical hinterland. The hinterland of choice was naturally Malaysia. Singapore thus entered a merger in 1963, but was expelled two years later, and hence we were, once again, in search of a hinterland. Perhaps we were lucky as a nation that, for all the horror stories about colonisation, the British chose Singapore as the crown jewel of the British Empire and hence built up port facilities in Singapore. This meant that, even after our independence, we had some geographical advantages that we could immediately exploit. However, we looked not only at sea, but also at air. Note that we can connect to commercially important locations such as Tokyo, Sydney, Beijing, Hong Kong and New Delhi, all within 7 hours. Add onto the ASEAN catchment, and Singapore is able to access three billion people within a 7-hour flight. Commercial companies jumped at the idea of exploiting our geography as well. For instance, given our small population, it was senseless to start an airline, because there would be almost no domestic demand to fuel air travel. Instead, we looked outward, and became a key part of the Kangaroo Route. The story of the hinterland, however, does not end here. While geography may look static, technology and ambition are dynamic. Technological advancements and grandiose ambitions have changed how trade and passenger flows are envisioned. What we consider a geographical advantage today could disappear from our very eyes. Port cities are always under threat from other coastal cities that can perform their function more efficiently. An example that springs to mind is Hong Kong, that competes against other ports in southern China. Closer to home, however, we have also seen competition against Port Tanjung Pelepas and Klang. Is the competition, however, confined with the region, as these examples might suggest? The answer is “no”. There have been ideas to bypass the Straits of Malacca. 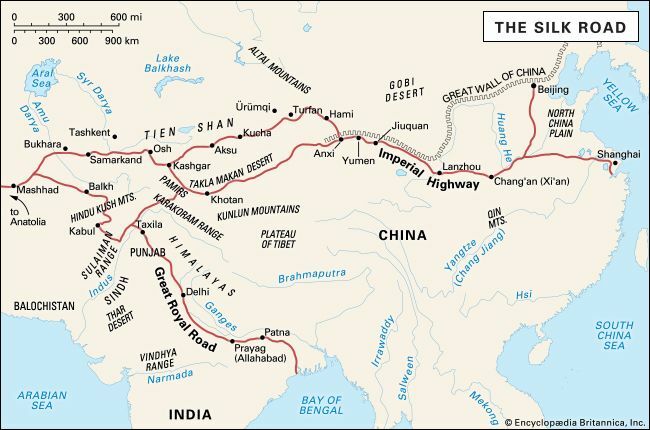 In fact, in the old days, Europe-Asia trade could also be conducted by a land route, namely the Silk Road. However, ship could carry far more cargo than trains ever could, resulting in the shipping route still being preferred. In the ancient days, trade was also conducted by a land route. One of China’s main objectives with its “Belt and Road” initiative lies in securing its supply chain. One example is in its oil imports. Despite diversification into Russia and Kazakhstan, much of its oil still originates from the Middle East. The main method of transport is through the Straits of Malacca, a point that it has no control over. One method of securing its supply chain is in the diversification of trade routes. A summary of the main routes that would be developed as part of the Belt and Road initiative. Note the diversification, and how it would be possible to bypass the Straits of Malacca. Other projects such as the proposed “Kra Canal“, too, can impact our ports. Besides the Belt and Road, there are also other trade routes considered, such as a route that opened through the Arctic owing to the melting of the polar ice caps (a reason why we are in the Arctic Council as an observer). These will certainly impact Singapore’s “sea hinterland”. On the air front, we are also affected. The rise of Dubai’s air hub has also threatened traditional Kangaroo Route players. Because of Dubai’s proximity to various Tier 1 and Tier 2 European cities, Dubai is able to offer European connections far more efficiently than traditional stopover points like Hong Kong, Bangkok and Singapore can. This has led to a structural change in the Europe to South-East Asia and Europe to Asia markets, where the Middle Eastern airlines, Emirates and Qatar, have eroded Singapore’s competitive advantages on the Kangaroo Route. Perhaps, the fate of a city-state is its eternal search for new hinterlands as old hinterlands vanish. What services can we offer the world, so that we may be able to sustain the economic dream as a prosperous city state? The answer has increasingly swung towards two directions, digital and management. I shall only dabble with the first, owing to the nature of this blog. Digital innovations transcend geography. Distances are no longer as relevant; transmissions can travel at light speed in fibre optic cables. In fact, many industries have witnessed “digital transformations” of their own. In the medical industry, telemedicine has taken off. No longer is there a need for a radiologist to be on-site; your X-ray can be taken, and passed onto a radiologist at a more centralised location (economies of scale), analysed, and returned to your location. This has certainly changed medical practice; some medical practitioners can be consolidated to central locations, exploiting economies of scale to lower labour costs. In the e-commerce industry, online shopping has proven to be far more efficient than offline shopping for many types of goods, as long as said goods are standard. An online shopping interface, coupled with an effective logistics channel has changed how we interact with the marketplace. The offline retail space has also transformed into more experiential concepts to engage with customers as opposed to simple display fronts. Why is this relevant for Singapore? We can hop onto the digital bandwagon in two ways, effectively reigniting the global hinterland. What might these two main ways be? First, the provision of digital services. Because of Singapore’s city-state positioning, Singapore can become a global test-bed for many experiential technologies. Its small size means that experimenters do not need to contend with physical constraints like infrastructure, prior to testing their ideas. These range from private hire ideas like Grab to food delivery ideas like Foodpanda. The extent of what can be digitalised remains unknown, as technology companies continue to push the boundaries. Autonomous systems like self-driving can be more easily conducted in Singapore owing to the smaller size and more consistent terrain. Second, if Singapore provides plenty of digital services, who is going to secure all of them? This is where cybersecurity comes into the picture. Besides being a digital hub, we also become a cybersecurity services hub simultaneously. There is little point on going digital if the confidentiality, integrity and availability triad in a digital service cannot be assured off. Hence, there is room for cybersecurity firms to grow in Singapore, as long as there exists digital services that need to be secured. What might the hinterland story advise us? Hinterlands are everywhere, and especially for a global world, the world is our hinterland. The question is whether we see beyond our constraints and identify opportunities, and thereafter, understanding how one can exploit the dynamics of the opportunities we may have.